YM CA Fleetwood in partnership with Wyre Council bring you Marine Splash! Come and make a splash to beat the summer heat at Marine Splash Pad and Café. 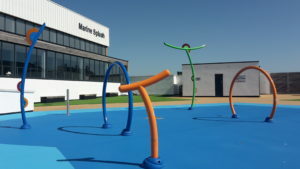 Opened in August 2015, Marine Splash at YMCA Fleetwood provides youngsters with the opportunity to splash through fountains, water jets and water tunnels, with a paddling area also included. Marine Splash will open for the summer period on Saturday 4th May and will be open every weekend thereafter. During the school holidays until September, Marine Splash will be open 7 days a week. All opening times will be weather permitting. Unfortunately, you cannot bring your own food as we have a café on site. Don’t forget to visit the Splash café serving hot and cold food and drinks, ice cream and shakes. For more details about the YMCA Fleetwood Cafe and current menu, please visit our page. *Opening Times may vary dependent upon weather and Bank Holidays. Please note: Capacity is 100 paying children max. Thanks to our partners and the team at YMCA Fleetwood, during the summer holidays children residing in Fleetwood with an FY7 postcode will be eligible for free entry to Marine Splash in addition to free swimming during public swimming sessions.